In the competitive field of manufacturing, your business needs to stand out. A great looking website optimized for local search engines can help your manufacturing business find new customers and grow. Localmize designs, builds and hosts websites for manufacturers with outstanding results; our manufacturing customers appear at or near the top of Google search results for their most relevant industry keywords. Don’t settle for a cheap template that makes your manufacturing business look just like the competition. Get a custom, professional design that is personalized to your manufacturing business. The Localmize team will create a custom website that reflects your business’s unique specialties, customer base, and service areas. Building a custom website increases sales by creating authority and authenticity online for your manufacturer website. Our design team doesn’t just focus on the aesthetic our websites; we also optimize our websites so that your business is one of the top results when customer search for your services on Google. A custom, optimized website from Localmize will drive new leads, increase your web traffic and generate revenue for your business. Localmize offers a complete turnkey solution for manufacturers. Say Cheese! Localmize designed and built the Scott’s of Wisconsin’s website. 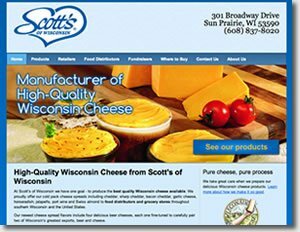 The manufacturer’s website includes brochures and images of their cheese as well a list of locations where you can buy their cheese. Interested in our online marketing services for manufacturers? Take a look at our manufacturing search engine optimization services and FAQ page! Call 877-700-1990 to speak with a Manufacturer Website Design expert.